Home › Blog › Bringing In The…. Bringing in the Heavy Equipment! 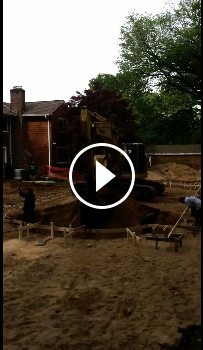 Here we’re excavating for a 20 x 40 ft. Double-Roman End Gunite pool, with our hard-working crew customizing the sides of this masterpiece by hand! Check out a design rendering of this gorgeous project in the post below!